Former Baltimore Mayor Kurt L. Schmoke laughed when he recalled how Cardinal William H. Keeler once tried to reach him at City Hall. The cardinal got through to the mayor’s assistant, who didn’t realize who was at the other end of the phone line. “Just tell him it’s Bill Keeler calling,” the cardinal told the woman. “Who?” the woman inquired politely. 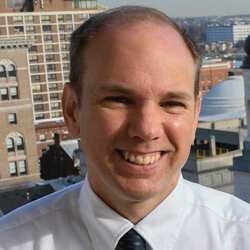 When the assistant took the message to the mayor, she was stunned to discover the man who called was the spiritual shepherd of approximately half a million Catholics in the Archdiocese of Baltimore. She promptly called back and put him in touch with Schmoke. Cardinal Keeler, who died March 23 at age 86, had consulted Schmoke on a wide variety of issues, including Catholic education and support for people in poverty. The two were especially interested in keeping Catholic schools open in the city at a time when public and private schools alike were facing severe economic challenges. The former mayor pointed out that parents who had not been very active when their children were in public schools became very involved when their children enrolled in Catholic schools. Cardinal Keeler developed the Partners in Excellence program that provided tuition assistance for children from low-income communities. Schmoke also worked with Cardinal Keeler on developing a new homeless shelter in the city. 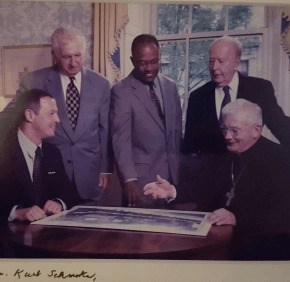 The former mayor keeps a photo in his office that captures a meeting at the cardinal’s residence with Cardinal Keeler, then-Baltimore Mayor Martin J. O’Malley and former mayors Schmoke, William Donald Schaefer and Thomas D’Alesandro III. Schmoke accompanied then-Archbishop Keeler to Rome in 1994 when the cardinal was elevated to the College of Cardinals. The mayor and his wife observed that the cardinal’s interactions with St. John Paul II seemed “more than just an informal, professional relationship,” Schmoke said. Schmoke, who was mayor when the pope visited Baltimore in 1995, said the key to Cardinal Keeler’s effectiveness as a leader was his ability to listen.